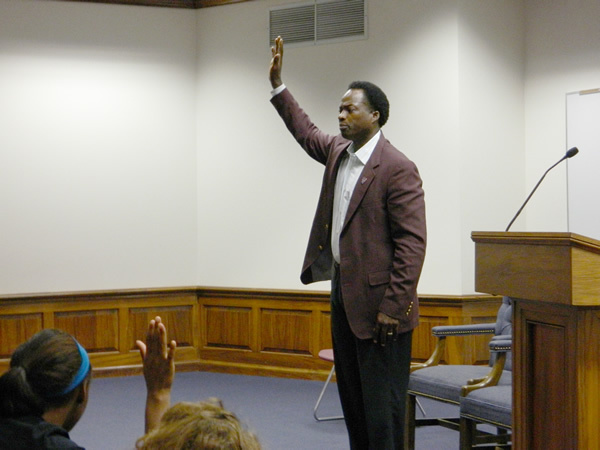 Former University of Alabama and NFL running back Siran Stacy spoke to Samford University student-athletes at a recent SamfordStrong Leadership Academy seminar Sept. 13. The SamfordStrong Leadership Academy is a program jointly developed between the athletics department and the Frances Marlin Mann Center for Ethics and Leadership. Its mission is to bring in successful athletes to share their personal stories, and the importance of faith and character to success in all areas of life to Samford student-athletes.